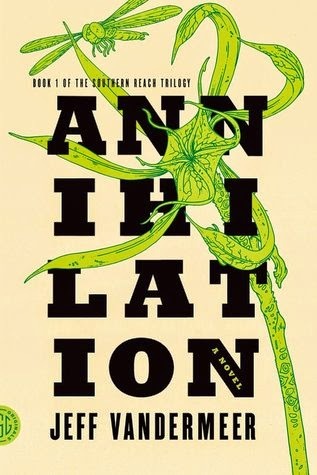 So is it with Annihilation by Jeff Vandermeer. Summaries do not do this book justice. Its story colonized me. It was not an invasion; it did not attack my brain, insistent that I continue reading. I was not forced by fear to discover if the hero lives. My limbic system did not spike me with adrenaline until I finished. Instead, slowly, phrase by phrase, the story moved into my head. Area X edged into my imagination. The biologist’s words whispered to me. Leafy tendrils unfurled around me, gently scenting the air with greenness. The basic plot: a biologist, a psychologist, a surveyor and an anthropologist are the twelfth team sent to explore the mysterious, primitive, Area X. Other expeditions have all gone drastically wrong, but due to an inability of technology to function in Area X, no one knows exactly how or why. In order to maintain control over the trip and the experience, the team is stripped of their personal identity, leaving only their roles to define themselves. The biologist narrates their experience in Area X, providing a touchpoint for the reader’s conception of the world Vandermeer is working in. I found the combination of the uncertainty of the background world, the mystery of Area X and the beauty and specificity of the writing irresistible. In fact, it functioned as a lighthouse for them, adrift in Area X and from each other. The biologist is a solitary woman, and her self-containment makes a profound statement. Of course, they all are particularly isolated–there is a strange lack of emotional connection between them–but the biologist’s fascination with the creation around her sets her apart. I finally realized the deep sense of familiarity I had reading: Jeanette Winterson’s profound, substantive writing style (Lighthousekeeping) collaborating with David Quammen’s enthusiasm for biology (I really need to bump him up on the to-re-read list). Together Vandermeer has created a sophisticated blend of science fiction, vaguely ominous, reminiscent of Sherri Tepper mid-career. Identity, connection and environment are all major themes threading through Annihilation, themes that are often shared with the writers mentioned. For some, the pitch-perfect writing won’t be enough to sustain them through slow plot build and even slower resolution. Like The Night Circus (review), this isn’t a plot-driven story as much as one based on both character and ideas, with writing that is truly well-crafted. It worked for me, yet I’m also left with the feeling that I might just want/need to read it again after finishing the final book, Acceptance. It’s that kind of story.